In this episode we look at the single biggest factor that impacts your performance at work, the 7 major catalysts for creating progress in your life, we dig deep into the data to look closely at the correlations between mental states and actual performance in terms of creativity, technical skill, productivity and much more with Dr. Teresa Amabile. Dr. Amabile is a Professor and Director of Research at Harvard Business School. She received her Ph.D. in psychology from Stanford. Her research investigates how life inside organizations can influence people and their performance. She has published over 100 articles in top scholarly journal and is the co-author of The Progress Principle: Using Small Wins to Ignite Joy, Engagement, and Creativity at Work, as well as Creativity in Context and Growing up Creative. The "intrinsic motivation principle of creativity” and why it matters to you! If you want to master motivation for yourself and others, listen to this episode! 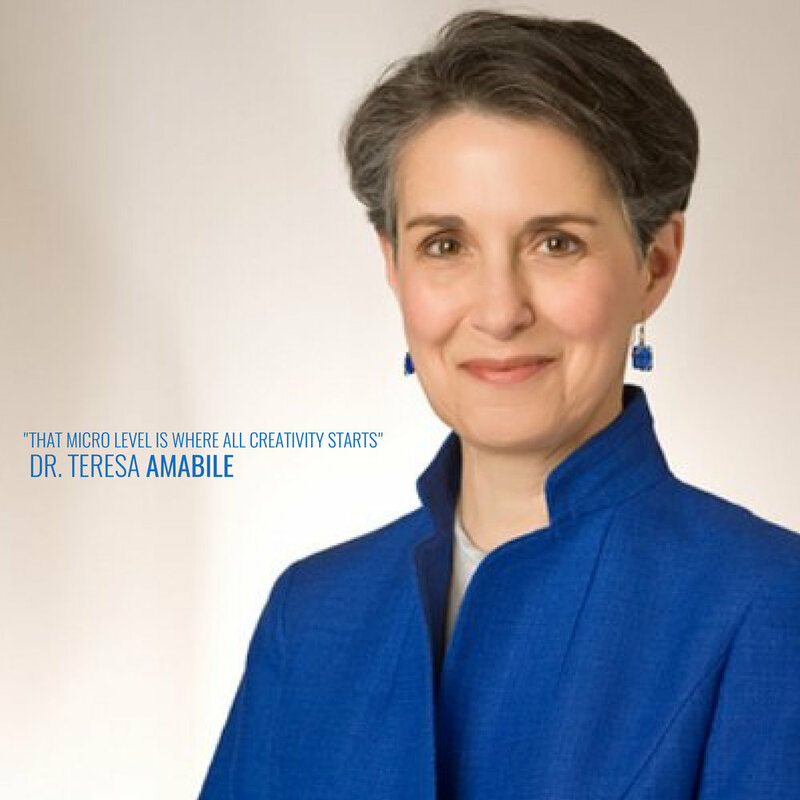 Today, we have another incredible guest on the show, Teresa Amabile. Teresa is a professor and director of research at Harvard business school. She received her PhD in psychology from Stanford. Her research investigates how life inside organizations can influence people and their performance. She has published over a hundred articles in top scholarly journals and is the coauthor of The Progress Principle: Using small wins to ignite joy, engagement, and creativity at work, as well as Creativity in Context and Growing Up Creative. Teresa, welcome to the science of success. [0:02:54.2] TA: Hey Matt, I’m really happy to be here. [0:02:56.2] MB: Well we’re very excited to have you on. So for audience members who may not be familiar with you, tell us a little bit about yourself, your background, and how you kind of got into this field of research. [0:03:06.4] TA: I actually started my adult life as a chemist and made my way fairly quickly after working as a chemist for only about a year, made my way to a PhD in psychology and I’m really glad that I did. The thing is, I’ve always loved science from the time I was a little kid. I didn’t know that psychology was a science though until I got halfway through college as a chemistry major and I realized I was a whole lot more interested in the behavior of humans than the behavior of molecules. So that’s how I ended up doing the psychology degree and it was in grad school that I got some of the initial ideas for my research that I’m actually still playing out all these years later. I was lucky enough at Stanford to be able to work with a professor named Mark Leper. He was at that point doing some of the earliest research on what’s called “intrinsic motivation” and that’s the motivation to do something because you’re passionate about it because you find it interesting, enjoyable, personally satisfying, personally challenging. Mark had discovered, paradoxically, that rewarding people for doing something that they were already intrinsically interested in doing without a reward, offering them a reward to do it could undermine their intrinsic motivation. Could make them actually less interested in doing it later on when the reward was removed. This caused a huge hubbub in the field of psychology and I was absolutely fascinated by it and it occurred to me that not only might things like reward and other kinds of external motivators, not only could they possibly have a negative effect on people’s subsequent interest in doing something, but they might also have a negative impact on how people do whatever it is they’re doing, whatever the task is that they’ve been rewarded for. And I was interested in particular in how reward and other external motivators, external constraints, how those things could influence the creativity of someone’s performance. So I began doing some experiments, with children and with adults, while I was in grad school and I discovered what I called the “intrinsic motivation principle of creativity”. That is that people are more creative when they’re interested primarily in doing the work out of their own enjoyment of it, their own interest in it, their own sense of personal challenge and personal satisfaction rather than doing it because of extrinsic motivators, something that someone is holding out there as a carrot, or external constraints, something that someone is telling them to do. That intrinsic motivation principle has held up through dozens of experiments that I’ve done, that other researchers have done and it’s even held up in situations like business organizations where people are trying to do creative work on a day by day basis. So that was really the beginning of my research. It’s gone off into many directions, looking at the environments in classrooms and in homes that can best support children’s creativity, versus the classroom and home environments that can undermine it. As well as the business environments, the organizational environments that can be most conducive to people’s intrinsic motivation and creativity as well as looking at those obstacles that can get in the way of creativity at work. So that was the foundation of my research. The research that I did for The Progress Principle took off from there and began looking at things outside of creativities. Certainly including creativity, but that research looked at other aspects of performance. Including productivity, commitment to the work, collegiality, how people treat each other and it looked at psychological states beyond intrinsic motivation. Including emotions and perceptions that people have while they’re doing their work. [0:07:41.7] MB: That’s a fascinating journey and a very counterintuitive conclusion to some of the kind of common sense wisdom of how we think we should motivate people. [0:07:52.4] TA: Absolutely. That’s why I was so excited about these results when they first came out. [0:07:58.2] MB: I’m curious tell me as little bit more about Progress Principle and kind of some of the research that went into writing it. [0:08:04.8] TA: My collaborators and I wanted to understand how this positive and negative work environments for creativity at how they arise inside organizations we decided that it was really going to be important to look at what was going on inside people’s hearts and minds, if you will, day by day as they were working in order to get some real insight into what influenced people at that micro level. Because that’s where it all starts. That’s where creative ideas occur or die or never fail to come out, never come out at all, that’s where people can become more motivated or less motivated. On a day by day, and even maybe a moment by moment basis. So we were really interested in that very microscopic level, what are people thinking, what are they feeling, how motivated are they in their work, and ultimately does this influence their creativity? How does it influence their creativity and their productivity and those other aspects of performance? We called those internal psychological states of emotions, perceptions and motivations, we call that an inner work life. Everybody has inner work life all the time while they’re working, whether they’re conscious of it or not. So we all have a continuous stream of thoughts and perceptions. That’s just really the impressions that we form of our work our colleagues, coworkers, our managers, our organization, what’s going on and what it means. So that’s perceptions. It’s also the ongoing stream of emotions that we have. So at any given moment, we could be experiencing mild positive emotion, extreme positive emotion, mild or extreme negative emotion, we could be in a more or less neutral emotional state but most of us have some sort of motivation, emotion going on most of the time that we’re at work. Again, even if we’re not aware of it and positive and negative emotions can actually coexist. That third component, motivation. We all have some degree of motivation for our work and every moment that we’re working and we have both intrinsic and extrinsic motives for doing most of what we do. If we’re working in an organization or even working as a freelancer, we all have extrinsic motivations. Of course we all want to get paid, equitably and generously, for the work that we do. That’s always there as a baselines. We also have extrinsic motivators like deadlines very often and other rewards and bonuses that we might stand to gain. We all have the extrinsic motivator of wanting to look good and wanting other people to evaluate our work well. Many of us are extrinsically motivated by competition, wanting to do better than other people. Those extrinsic motivations are usually there for almost all of us, almost all of the time, they’re usually kind of in the background. We also have intrinsic motivation for what we’re doing, hopefully, most of us, much of the time and that is that feeling of real interest and engagement in the work itself. What my early experiment showed is that if those extrinsic motivators become too prominent, if they become the focus of why we feel like we’re doing what we’re doing, they can wipe out that intrinsic motivation, they can undermine it. So this was a tricky problem for us methodologically, how do we get in this? We decided the best way to do it would be to ask people to fill out a daily confidential electronic diary, toward the end of each work day. Short but piffy in terms of getting at their inner work life for that day specifically. So this little diary form that we emailed to everyone who participated in our study, toward the end of their work day, had a few numerical scale questions on it, getting at their inner work life that day. So there were flow survey questions on, “Today at work, did you perceive that you had support from your coworkers that you’d had support from your managers? Did you perceive support from the organization at large for the work that you were doing? Did you feel emotionally supported in your work day? How much time pressure did you have today? To what extent did you have access to the resources you needed?” So these are all perceptions and they were about half a dozen other questions about people’s perceptions of the work and their team, their manager, the organization that day. We also had some numerical questions on their motivations. Intrinsic and extrinsic motivation, and we had scale rated questions on their emotions that they experienced that day. That was a very quick sort of numerical, taking of the person’s inner work life temperature that day, if you will. Then, we did the x-ray, if you will, of what your work day was like. In particular, what stood out in their mind as being a significant event from the day, or at least something that they recalled when they thought back on their day. Something that stood out in their mind. So we had an open ended question at the end of the diary form and it simply said, “Briefly describe one event that occurred today that stands out in your mind. It can be anything at all, as long as it’s relevant to the work or the project that your work is part of. Please describe in detail what happened and who was involved.” They got that same question every day so they knew it was coming. We sent them these diary forms every day through the entire course of an important creativity project that they were working on. We assumed that some of this 26 projects would indeed be successful and some of them would not. We wanted to see if we could understand something about why creativity happened in some of these projects, didn’t happen in others. Why some of this people were able to creative in their work and be productive but others were not. Wanted to see if there was something going on in those work days that would allow us to make those predictions. So we followed this people 238 of them, they were professionals, we followed them every day through the entire course of their project. On average, these projects were four and a half months long. That’s a lot of weeks for people to be getting this diary every day, Monday through Friday. It was quick, it took them only about five to eight minutes to fill out but the data were incredibly fascinating and we had a lot of data. We ended up with nearly 12,000 of this individual dairy diaries being sent back to us. That’s 75% of the diaries that we sent to this people. We had an astonishing 75% response rate. These people filled out this diary form and sent it back to us. When we analyzed these diaries, we felt it was really important to correlate them with the actual performance of this people. We wanted to know what was going on inside their heads, their hearts and minds, during the work day, was that in any way related to their performance? This is the prediction that we wanted to make. So we had to have good measures of their performance, and we decided not to trust what they said about their own performance. We decided to ask people who knew their work well and that was their supervisors and their close colleagues. Monthly, during the study and by the way, there were some teams that were in the study for eight months, even nine months if they had a long-ish project. Monthly during the study, we asked every participant, close colleagues and supervisors to make a quick rating of them on a little questionnaire that just asked for assessments on four items, for each person who is participating in the study. The person’s creative contributions to the project over the previous year, their technical contributions to the productivity of the work, they demonstrated commitment to the work and their collegiality, how they treated the other people on their team. When we analyzed those data, those performance data against the inner work life ratings that we got from this people every day, we made an astonishing discovery. We found that on most days and most weeks and those months. When people were having the most positive perceptions of their organizations, their coworkers, their managers, even themselves, when they were having the strongest, intrinsic motivation for their work and they’re experiencing the most positive emotions, it was on most days and weeks and months that they were most likely to produce work that was creative. So we went back into the diaries and we analyzed everything what this people reported as an event in their day, in those open ended responses that they wrote, those on average 50 to 60 word paragraphs that they wrote about one event from their day. We categorized all these events using a very long and complex coding scheme and we wanted to see, are there certain events that show up repeatedly on people’s very best inner work life days? Are there other events that show up repeatedly on people’s very worst inner work life days? We thought, “Those would be the likely suspect for distinguishing between positive inner work life and negative inner work life. Those are the likely suspects for the events that make the biggest difference.” We found that if all the positive events that people reported, on their very best inner work life days, the single most prominent was simply making progress in meaningful work. I want to just explain a little bit about what we mean there. Making progress means moving forward, feeling like you’re getting somewhere in solving a problem or coming up with new ideas. Meaningful work means that the person feels that they’re contributing to something that they value in the work that they’re doing. Occasionally we found that people felt that they had made a lot of progress on work that they didn’t hear about, occasionally they felt that they were doing something that wasn’t really central to this important innovation project, that we’re doing something that they considered go for work or they didn’t know why they were doing this or they were stuck in a boring meeting all day that wasn’t really about the project. On those days, even though people thought they got a lot done maybe, they made progress, they didn’t have particularly good inner work life. But most of the time, because they were doing this important innovation projects, most of the time, most of this people did find meaning in their work, they felt they were contributing to something that really mattered to the company, to the customers, maybe even to society at large because of the things that they were inventing in this projects. When they felt that they were doing meaningful work, if they move forward in that work, they were more likely to have positive perceptions of the environment, the organization, their colleagues, their team, they were more likely to be strongly intrinsically motivated in their work and they were more likely to have these positive emotions. So what we found here is important and powerful tool that managers can use to help people do better in their work and not only do better in their work but actually have more positive inner work life experiences, have better experiences day by day in their work and that is for managers to simply pay attention to supporting progress. Supporting the progress that their people are trying to make in their most important work. We even found a carryover effect. We found that on those days when people are having progress events in their work, when they’re feeling happy in their work, not only are the more likely to come up with a creative idea or solve a problem creatively that day, they’re even more likely to come up with a creative idea the next day regardless of the next day’s mood. So what this means is that there’s an incubation effect, there’s kind of a cognitive process that gets setup when people are having positive inner work life that allows them to make new connections between ideas that they might not have connected otherwise or to get insight into difficult and complex problems and they can result in a solution or a new idea that day but if it doesn’t, it can actually kind or marinate or cook or incubate overnight and show up this creative idea or a good solution to the problem the next day. That’s a really powerful result and it means that managers would do well to pay close attention to what they could do to bolster people’s inner work lives day by day. I’ll be happy to talk a little bit more about what it is managers can do, if that’s a direction you’d like to go on the conversation. [0:24:06.8] MB: I’m curious for somebody who is listening, who might be a manager or in some sort of organizational role? How can they support progress, which you said is kind of a critical component of enabling people to make progress on meaningful work and also what are some of the biggest disconnects between what people think motivated their employees and what the research actually shows, empowers them and motivates them. [0:24:31.3] TA: Yeah, those are great questions. Matt, I’m going to actually answer your first question, your second question first. Managers are taught and they see, in this culture at least, that the way to motivate employees is to offer them rewards for the work, to have a bonus structure for example that will keep them motivated, keep them engaged, keep them plugging away at their work. Well we found through this day by day diaries, 12,000 of them, 12,000 days of people’s experiences was that they rarely were thinking about rewards and other extrinsic motivators during their work day. They rarely felt that that was motivating them in their work and we asked about it every day in the diary form. What really motivated them, it turned out, was feeling that they were getting somewhere, that they were making progress and also feeling that they were in a work environment that cared about them as people, that supported them as people and I hadn’t been emphasizing that because it turned out to not be quite as important as the progress factor but it actually is pretty important, this feeling that you are valued as a human being. So let me talk about the two sides of that. One is the progress side, the other is almost as important, the human side. We discovered when we went back into the diaries and looked at what kinds of things managers were doing, what kind of events people reported before they had this progress events. We discovered that there were a small set of things that managers did consistently that did support progress. We call this the catalyst to progress. There are seven of them. First, maybe most fundamentally, it’s very important for people to have clear goals in their work. To have a sense of what they’re doing and why it matters. That why it matters part is the meaningfulness part. But they need to have a sense of what it is they’re trying to achieve with the project, with this work that they’re doing. Other catalyst include sufficient resources for getting the work done, not lavish but sufficient to do the work so the people aren’t scrambling constantly and you then expending all their creativity, just getting the resources that they need, the funding, the materials and so on, the information, that they need to get the work done. Having sufficient time for the work. Again, not lavish amounts of time, there actually should be some sense of urgency in the work. Otherwise it will seem meaningless and unimportant if nobody cares about when the work is done, there should be some sense of urgency but the time pressure should not be extreme. We found that that can kill creativity. So sufficient resources, sufficient time. Help with the work when it gets difficult. I’m very aware, by the way, that these are entirely mundane. These sound like basic management 101. Bu the thing is, managers don’t pay attention to this things nearly as often as they should. If people in doing an important innovation project, if they’re struggling with something that’s really difficult, get help for them. Either by connecting them to others in the organization and what it would be able to help out or helping them out yourself. That can make a huge difference in getting people past the home and helping them to continue making progress in difficult work. The organization, the teams that did the best were those where people talked about the mistakes, talked about the failures, they called them out themselves. You know, “I did an experiment this week,” they would say, in the team meeting for example, “that failed and I’m having a hard time figuring out why.” Then the whole team would do a debrief. “All right, let’s talk about the steps you followed, what did you do here, what did you do there? All right, looks like maybe this is the reason that it didn’t work out.” So the whole team, including the individuals who did this failed experiment, the whole team extracted failure value from that thing that didn’t work. And then the debrief happened right away and they were able to move on from that and that team actually had one of the very true breakthroughs of any of the 26 teams that we followed during our study. So learning from problems is extremely important and the atmosphere that helps people do that is called “psychological safety” where you know it’s safe to speak up about things that are going wrong about failures and you’re not going to get ridiculed, you’re not going to get blamed. But people are going to actually deal with it and appreciate your bringing it up. [0:31:55.2] MB: That’s something we’re huge fans of on Science of Success in general is the idea of embracing failure, embracing mistakes and not casting blame or making excuses and we have a number of previous episodes about things like the fixed mindset, things like accepting reality, not making excuses. So I love to hear that some of the most successful companies in your study focused on that. [0:32:18.5] TA: That’s right. In fact, it was only one unfortunately out of the seven that was that successful. But there were other teams here and there that where we would see psychological safety and those teams did tend to do much better even when they were in other companies. There are other catalyst that we discovered that people couldn’t see, they look at the book. I did want to mention something about the people support. The emotional support for people, as human beings, is so important. Managers can do this by paying attention to first of all, basically respect in recognition for the value that each employee brings to the work. It’s really disheartening to see how seldom managers, from team leaders all the way up to top level leaders in an organization, how seldom they think to make a word of appreciation to someone, either in private or even better, in public. Just a simple way of noting what someone has done, let them know that they’re appreciated, to show them basic civility and respect. It’s really important also to have an environment where people are encouraged when the work is difficult or they have a sense that there’s confidence that they can overcome this obstacle and get the work done. It’s important for people to feel that they have emotional support. If they’re having difficulty in their professional life or their personal life and sometimes all that requires is a simple acknowledgement. Even if you can’t say, “What can I do to help, let me help? At least say, “I know that you’re going through a tough time right now and I’m sorry for that, I understand that things are really stressful for you.” That makes a huge difference. Comments like that from leaders made their way into the diaries when they happened, they had a huge positive effect on people’s emotions and perceptions that day. Finally a sense of camaraderie in a team, how can people feel that they’re in a group that can trust each other, where there’s mutual support, mutual understanding. Not that they don’t challenge each other, they should be open to each other’s ideas and that means challenging each other’s ideas too and really looking at them and trying to make them better. That sense of camaraderie can get people through a lot of difficult times in a project. [0:34:35.1] MB: So for somebody who is listening, and I know your research focuses primarily on organizational dynamics. For somebody who is listening that maybe works form home or works by themselves, how can they kind of create this progress principle for themselves? [0:34:50.5] TA: It’s not easy, but if you think about it, you can set a plan for yourself and it is doable, I’ve talked with many people who have tried this for themselves. First of all, set daily goals for yourself, not a lot of them. Maybe it’s one goal of something that you want to get done that’s really core to your work, that you feel is allowing you to get somewhere on what you consider most important in your work. Second, try to protect some time in your day to actually work on that goal. Even if it’s only half an hour, I know many of us get to work and we find that our work day ends up being pulled in a million directions that we didn’t anticipate. Depending on your role in an organization, that may be part of what you need to do is help put out the fires that are going on each day. But ideally you will be able to protect some time even if it’s only at the very beginning of the day before most people are there to focus on that most important part of your work, the thing that you care about the most, it’s more intrinsically motivating to you and allow yourself to dig into it and make at least a bit of progress on it. The third thing is to track your progress. I recommend and we talk about this in The Progress Principle. We recommend a daily progress journal where you spent not even more than two or three minutes at the end of the day noting what progress you did make in your work that day. If there were set backs to mention those and to see if you can get some insight into what caused those setbacks and what you might be able to do to overcome that obstacle. I’ve been keeping a progress journal myself in the last five and a half years or so, and I found that it really does make a difference. It helps me to stay tuned into my goals, I think it does help me to make more progress in my work and it certainly uplifts my inner work life to note what progress I made during the day, even if it was a small thing, because many days feel pretty frustrating at the end and it’s great to have that little boost in your inner work life. [0:37:00.5] MB: We’ve obviously gone in depth into some of the lessons and much of the research behind Progress Principle. What are some additional resources you would recommend for somebody who wants to do some research or kind of dig in a little bit more about this topic? Do they have sufficient resources, do they have the help that they need? So just going through that checklist, daily or even weekly, can help manage you stay tuned in to what people need and help them figure out ways of supporting progress and the daily diary form is something that people can use to do what I was just talking about, to keep track of those goals and their progress against those goals. We found that even the small wind that is a small step forward can have an enormous impact, positive impact, on people’s inner work life every day. Let me give you the website, it is simply progressprinciple.com. [0:38:36.6] MB: Got it, and is that where people can find you online? [0:38:40.2] MB: Perfect, and what is one piece of homework that you would give to our listeners? [0:38:44.9] TA: Wow, I would ask your listeners to try this out today, write down one or two important goals that you have in your work for the next couple of weeks and make a plan to protect some time in your day today and tomorrow to make progress against those goals. Just for this two days, at the end of the day, spend a couple of minutes writing out what progress you felt you did make in the goals and if you had setbacks, you weren’t able to get much movement on those goals, what you might be able to do to remove those obstacles. [0:39:22.8] MB: That’s a great piece of homework and I think something that I may implement myself. [0:39:27.7] MB: Well, Teresa, this has been fascinating and I loved really going deep into some of the research and the astounding amount of data that you collected and the findings from that data. Thank you so much for coming on the show and sharing all these incredible insights. [0:39:42.4] TA: It was my pleasure Matt. I wish you and your listeners as well.